Discovered in 2004, Dilong is one of the most primitive known tyrannosaurs, a group that includes Tyrannosaurus and other similar dinosaurs, and the first tyrannosauroid discovered with feathers. 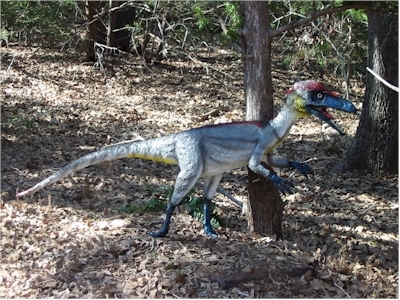 Dilong differs from Tyrannosaurus in having proportionally larger forelimbs and three-fingered, grasping hands. It also shared many advanced features of the skull with later tyrannosaurs—such as fused nasal bones, extensive sinuses, and a rounded snout.